Sometimes small businesses start out using e-commerce platforms such as Amazon and eBay to start their business. It seems that Amazon is currently the biggest player in the international market. A study carried out by Website Builder Expert, looked at the power that Amazon has and how it compares to the international competitors such as eBay and Alibaba. Worldwide online expenditure is expected to exceed £3.5 trillion by 2020, making the online market very competitive. 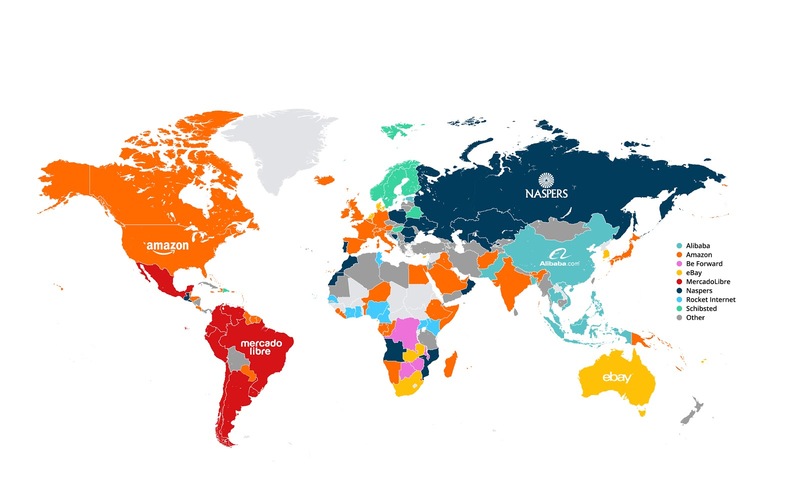 The map above shows which e-commerce websites are dominating different parts of the world. Small businesses that are deciding which platform to host their online business on will need to consider who is rising in popularity. It is not surprising at all that Amazon is the biggest e-commerce empire in the world. It reaches 58 countries and has an online population of around 1.2 billion. The numbers speak for themselves when it comes to Amazon’s stand in the online market. Alibaba of the east is the only other e-commerce platform to come close. The online population of Alibaba is just over one billion and is popular in 15 countries compared to Amazon’s 58. Amazon has not yet secured the strong foothold in Asia, as that would mark it as the world dominator. Most of Amazon’s customers come from North America and Europe. But Amazon is always expanding, which only adds to its popularity. With the acquisition of Souq in 2017, a Middle Eastern e-commerce platform, Amazon has now managed to reach the Middle East. However as well as Asia, it has struggled to be the power player in South America. MercadoLibre, a Spanish e-commerce platform is the platform that currently dominates the South American online market. Frederick O’Brien, the lead researcher of the study commented: “Amazon’s huge global audience means that small businesses can reach potential customers on a scale that would take significantly longer without the clout of the Amazon brand. Earlier this year Amazon reported that over 20,000 businesses across the world generated $1 million dollars in sales through their platform, proving that there is huge potential for international success. The framework is there, the audience is there – it’s up to small businesses to seize the opportunity”. eBay isn’t what it used to be, it dominates in only 13 of the 174 countries in the study, and the online population stands at just over 132 million. Australia is the key location for eBay, with it being the most popular platform for Australians. India and Africa seem to be the next two targets for all the giant online empires. India’s e-commerce industry is growing faster than any other country in the world. India, being in Asia will see the battle between Amazon and Alibaba, to see who claims the territory. Africa is also an attractive area to tackle as it is home to around 1 billion potential customers. These findings seem to suggest that Amazon is currently king of the online business and will remain so. With a stronghold in Europe and North America and potential expansion in other territories, it is a force to be reckoned with. More on news and starting an online business. UK economy to overtake Germany’s by 2030?